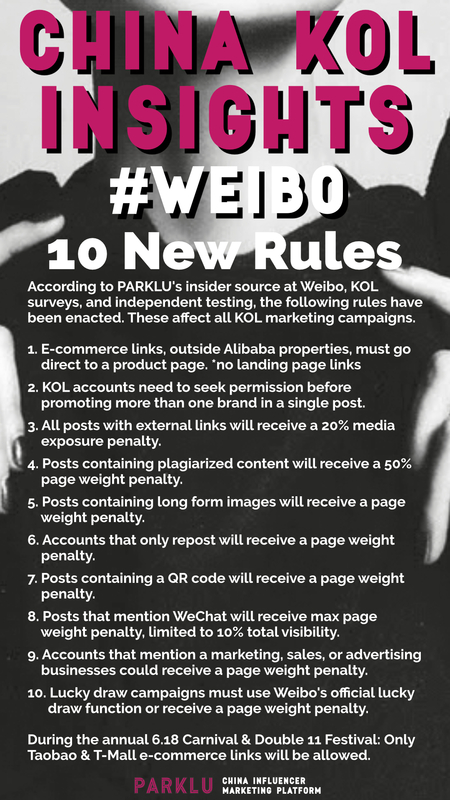 According to PARKLU’s insider source at Weibo, KOL surveys, and independent testing, the following 10 rules have been enacted on Weibo. These affect all Weibo KOL marketing campaigns. 2. KOL accounts need to seek permission before promoting more than one brand in a single post. 3. All posts with external links will receive a 20% media exposure penalty. 4. Posts containing plagiarized content will receive a 50% page weight penalty. 5. Posts containing long form images will receive a page weight penalty. 6. Accounts that only repost will receive a page weight penalty. 7. Posts containing a QR code will receive a page weight penalty. 8. Posts that mention WeChat will receive max page weight penalty, limited to 10% total visibility. 9. Accounts that mention a marketing, sales, or advertising businesses could receive a page weight penalty. 10. Lucky draw campaigns must use Weibo’s official lucky draw function or receive a page weight penalty. During the annual 6.18 Carnival & Double 11 Festival: Only Taobao & T-Mall e-commerce links will be allowed.